Hardships tested the mettle of men on the trail. Sever weather at times mad conditions hazardous as well as miserable and there was always the treat of stampedes caused by a bolt of lightning a loud clap of thunder or the trickery of raiders. The scattering of cattle meant that there would be no rest for drovers until the strays were rounded up. Millions of longhorns were driven northward across the plains to railheads in Kansas during the period 1867 - 1889. The great cattle drives not only helped to feed a nation just after the Civil War, they produced one of the Nation's most enduring heroes -- the cowboy. 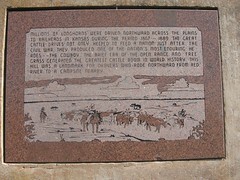 The brief era of the open range and free grass generated the greatest cattle boom in world history. This hill was a landmark for drovers who road northward from Red River to a campsite nearby. 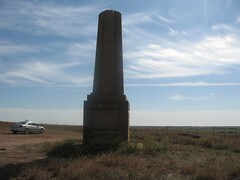 During the days of cattle drives, Monument Hill was a frequent stop for cowboys as they travel over the Chisholm Trail. The highest point in Jefferson County, the view extends up to 20 miles. 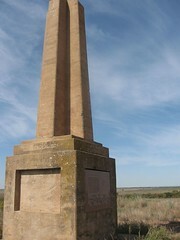 This monument set on 9/10 th of an area surrounded by Stuart Ranch on three sides is owned by the Price Cattle Company. 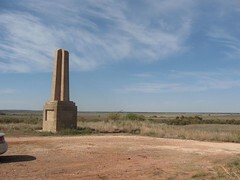 10 to 12 years ago historical markers were placed into the base of Monument Hill marker, providing facts on the Chisholm Trail Lookout Point. Those markers were provided by Margaret Bradly and her brothers, all Price family members. 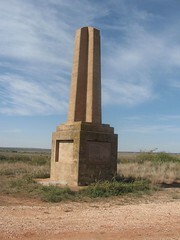 The monument was built prior to World War II, but was never completed because of the War and a lack of funds. The Pickens County cowpunchers Association built it. 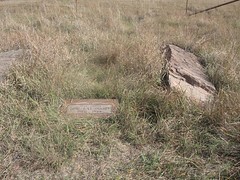 Sometime in May or June of 2005 the marker was vandalized and 2 markers were destroyed. Members of the family hope to have the marker restored. 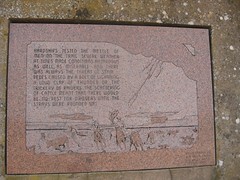 The markers were designed by Bill Willis of Willis Granite Company. 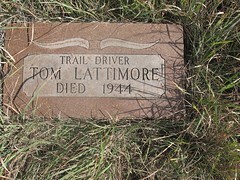 Price ranch hand, Tom Lattimore, was buried southwest of the monument, sometime during the 1940's, he was the first black hand, Lattimore was a Chisholm Trail cowboy . He wanted to be buried on Monument Hill and his reason "the cowboys will always be going by there and they'll stop and remember me". He was in his 80's when he died. His marker was not damaged when the monument was vandalized.